Not to be confused with Room (2005 film) or The Room (film). In Akron, Ohio, 24-year-old Joy Newsome and her 5-year-old son Jack live in a squalid shed they call Room. They share a bed, toilet, bathtub, television, and rudimentary kitchen; the only window is a skylight. They are captives of a man they call "Old Nick", Jack's biological father, who abducted Joy seven years prior and routinely rapes her while Jack sleeps in the closet. She tries to stay optimistic for her son but suffers from malnutrition and depression. She allows Jack to believe that only Room and its contents are real, and that the rest of the world exists only on television. Old Nick tells Joy that he has lost his job and threatens that he may not be able to afford their supplies in the future. That night, Jack is overcome with curiosity and ventures out of the closet while Old Nick is asleep in bed with his mother. Joy is horrified when she awakens and sees their interaction, slapping Old Nick away. As punishment, he cuts their heat and power. Joy decides to tell Jack about the outside world; he reacts with disbelief and incomprehension, but also curiosity. She has Jack fake a fever, hoping that Old Nick will take him to a hospital where he can alert the authorities, but Old Nick says he will return the following day with antibiotics. Joy wraps Jack in a carpet and has him play dead in the hope that Old Nick will remove him from Room. Falling for the ruse, Old Nick places Jack in the back of his pickup truck and drives through a residential neighborhood. Although stunned by his first exposure to the outside world, Jack jumps from the truck and attracts the attention of a passerby. The police arrive and rescue him. The police discover Joy as well, and take her and Jack to a hospital. Old Nick is captured and arrested. Reunited with her family, Joy learns that her parents have divorced and that her mother has a new partner, Leo. She returns with Jack to her childhood home where her mother and Leo reside. Her father cannot accept Jack as his grandchild and leaves. Jack struggles to adjust to life in the larger world, speaking only to his mother and expressing a desire to return to Room. Joy struggles with anger and depression, lashing out at her mother and becoming worried about Jack's lack of interaction with "real" things. At the suggestion of the family's lawyer, Joy agrees to a television interview, but becomes upset when the interviewer questions her decision to keep the newborn Jack instead of asking Old Nick to take him to a hospital. Overwhelmed with guilt, she attempts suicide; Jack finds her unconscious in the bathroom, and she is admitted to a hospital. Jack misses his mother but begins to settle into his new life. He bonds with his new family, meets Leo's dog, Seamus, and makes friends with a boy his age. Believing his long hair will give Joy the strength she needs to recover, Jack has his grandmother cut it for him so he can send it to her. Joy returns home and apologizes, thanking Jack for saving her life again. At Jack's request, they visit Room one last time, escorted by police. Jack is confused; he feels it has shrunk and that it is a different place with the door open. He and Joy say their goodbyes to Room and leave. Emma Donoghue, who also wrote the novel on which the film is based, wrote the screenplay for the film before the novel was published in 2010. She explained she felt sure the book could be made into a film because of its structured storyline, and received many offers from filmmakers after it was published, which she rejected for creative reasons. Director Lenny Abrahamson read the novel and sent Donoghue a 10-page fan letter telling her it should be a film, without knowing a screenplay already existed. Donoghue felt the letter demonstrated an understanding of her work and advocated for him as director. In 2012, Abrahamson and Donoghue spent one week at her house in London, Ontario as they revised the screenplay. She served as executive producer and was included in major filmmaking decisions. Abrahamson credited Donoghue with securing funding from Canada, where she is a citizen. She also suggested shooting in Toronto because it could resemble the United States, and she believed it would be awkward for many Irish filmmakers to work in the U.S. Canadian producer David Gross helped persuade his Irish co-producers to shoot in Canada rather than the U.S., saying they could have a longer schedule and more money in Canada. Emma Watson, Rooney Mara, Shailene Woodley and Mia Wasikowska were considered for the role of Joy. Brie Larson was cast after an associate of Abrahamson suggested he see her in Short Term 12. Larson consulted with a trauma expert and a nutritionist for the role, went on a restrictive diet and avoided sunlight. She said she saw the film less as a crime story and more of "a story of love and freedom and perseverance and what it feels like to grow up and become your own person". 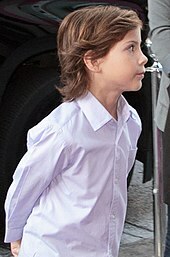 The filmmakers considered dozens of child actors for Jack before choosing seven-year-old Jacob Tremblay from Vancouver. Tremblay said his part was not hard "because I was playing a happy child" unaware of the sinister nature of Room. As he was too young to read the whole screenplay, each scene was explained to him one by one. Tremblay wore a wig made from human hair. According to Joan Allen, who played Nancy, Larson and Tremblay met for over three weeks to build a "very tight, obviously critical, close relationship", before the Room scenes were shot over five weeks. Allen arrived in Toronto later and met Tremblay, "But we didn't want him to become too familiar with me because that's not what the story is." In preparing for her own role, Allen did not consult real mothers of kidnapped children, but said she reflected on her own experiences "in a mall when my daughter was little and I look around and within a flash she's not there". Canadian actor Tom McCamus auditioned for the part of Old Nick before being cast as Leo. The actors improvised some lines, with Donoghue saying they created "speech patterns more natural-sounding than I could have written, and produced some brilliant new lines that ended up in the film." Abrahamson used only one Room set, wanting to create an authentic experience for Tremblay. The set, built on a soundstage at Pinewood Toronto Studios, was 11 ft × 11 ft (3.4 m × 3.4 m). Montreal production designer Ethan Tobman set out with the idea "that every square inch of Room needed to have a backstory". To fit the crew and equipment into the small space, he made each piece of the set removable. However, as Abrahamson and cinematographer Danny Cohen wanted the camera to always shoot scenes from inside Room, the lens was always positioned within the set even if the rest of the camera was outside. There were as many as eight cameramen at a time inside the Room set with Larson and Tremblay. The actors also made the props decorating the set. Because the scenes set outside Room were filmed after the scenes inside, the crew was initially eager to leave the cramped space, expecting that the rest of the film would be easy. However, they had difficulty adjusting to the cold weather, traffic and crowds in Toronto. Cohen remarked that upon returning to the Room set for the final scene, the set appeared smaller to the crew. Cohen used a Panavision Primos lens on a Red Epic Dragon camera, saying "The Primos and using Kino Flos, which is more akin to fluorescent lighting, gave Room a certain texture, a certain look." Principal photography began on 10 November 2014 and ended on 15 December 2014. Editor Nathan Nugent served as second-unit director. He described his editing of Room as simplistic, keeping the acting intact, while working in Dublin for five months. However, Tremblay's part was filmed in numerous takes so Tremblay could give variations of his performances of specific lines, so Abrahamson and Nugent had to assemble and splice the different takes in the editing process. Prior to production, A24 acquired U.S. distribution rights to the film. Room had its world premiere on September 4, 2015, at the Telluride Film Festival. It went on to screen in the Special Presentations section at the 2015 Toronto International Film Festival. and at the London Film Festival, on October 11, 2015. The film began a limited release on October 15, 2015. Room was released in the United Kingdom and Ireland on January 15, 2016, by StudioCanal. It went into wide release on January 22, 2016. The film was released by Lionsgate on DVD and Blu-ray in the United States on March 1, 2016. It was released on DVD and Blu-ray in UK and Ireland in May 2016. 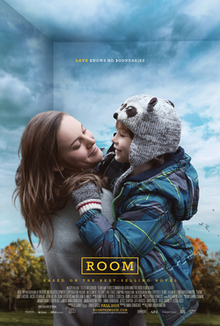 After its U.S. release on October 16, 2015, Room played in a peak of 198 theaters from December 11 to 13, and grossed $5,166,724 before its Academy Award nominations were announced, making it one of the lowest-grossing Best Picture nominees in years. Initial box office under-performance came as a surprise to Canada's Elevation Pictures, since winning the People's Choice Award at the Toronto International Film Festival was usually a predictor of financial success. However, the nominations gave the film a boost at the box office, and after opening in the Republic of Ireland on 15 January, it initially made €200,000 at 50 theatres. A month after its release in Ireland, it had grossed more than €1 million nationwide. On 24 April, Room completed its run having grossed an estimated $14.7 million in North America and $20.7 million in other territories, for a worldwide total of $35.4 million on a $13 million budget. Room received widespread critical acclaim. Review aggregation website Rotten Tomatoes gives the film a rating of 94%, based on 293 reviews, with an average rating of 8.4/10. The site's critical consensus states, "Led by incredible work from Brie Larson and Jacob Tremblay, Room makes for an unforgettably harrowing—and undeniably rewarding—experience." Metacritic gives the film a weighted average score of 86 out of 100, based on reviews from 43 critics, indicating "universal acclaim". Todd McCarthy from The Hollywood Reporter wrote, "Overall, it's a decent shot at a tall target, but real credit is due the lead actors, with Larson expanding beyond the already considerable range she's previously shown with an exceedingly dimensional performance in a role that calls for running the gamut, and Tremblay always convincing without ever becoming cloying." Eric Kohn of IndieWire stated, "Brie Larson and newcomer Jacob Tremblay['s]... textured performances turn outrageous circumstances into a tense and surprisingly credible survival tale." Richard Roeper of the Chicago Sun-Times called the film "the most impressive piece of filmmaking I've seen in 2015, and one of the best movies of the decade". Rex Reed said Room is "so powerful and unforgettable that it must be seen" but "too grim and heartbreaking for some viewers". The central performances of Brie Larson and Jacob Tremblay have received critical acclaim. Joe Morgenstern of The Wall Street Journal said "this drama is as big as all outdoors in scope; poetic and profound in its exploration of the senses; blessed with two transcendent performances, by Brie Larson and Jacob Tremblay; and as elegantly wrought as any film that has come our way in a very long while." Peter Travers of Rolling Stone wrote, "All you need to know is that the performances of Larson and Tremblay will blow you away. Tremblay is a child actor incapable of a false move. And Larson, so good in Short Term 12, is magnificent, finding a way into Joy's bruised psyche that tears at your heart." The film received positive reviews in its countries of origin, with Barry Hertz of Canada's The Globe and Mail writing "Room is a film of tiny little miracles," finding it uplifting, praising Larson's performance and referring to Tremblay as "a wide-eyed wonder who is always genuine". Chris Knight for the National Post called Tremblay "preternaturally talented", and said Room "works on a tiny canvas, but in doing so it emphasizes that great things can be accomplished in tight spaces". Liz Braun of the Toronto Sun said Jack's narration made the Room scenes "joyful" as well as claustrophobic, and that Larson and Tremblay's performances are "completely engaging". Linda Barnard of the Toronto Star called Room "equally tender and chilling", In Ireland, Donald Clarke of The Irish Times gave the film five stars, calling it "harrowing", and concluded, "We are left with a film that manages a degree of optimism in the most unpromising circumstances. It is a substantial achievement." Daniel Anderson, writing for the Irish Examiner, called Room "an utterly unique tale which has seen the filmmaker deservedly thrust onto the world stage", but also "bleak" and "difficult to recommend". Dissenting, Kyle Smith of the New York Post wrote "The script [...] doesn't illuminate what kind of internal damage might be wrought by being held prisoner for seven years: On-screen it simply looks like Joy has a case of the sads." Matthew Lickona of the San Diego Reader also called it "a cowardly movie about brave people". Room has received many awards and nominations. Brie Larson's performance in particular has been singled out for awards, with the National Board of Review, Chicago Film Critics, and various other film critic organizations awarding her Best Actress. Larson has also won several major awards, including the Academy Award, Critics' Choice Award, Screen Actors Guild, BAFTA Award and the Golden Globe Award for Best Actress. Emma Donoghue's screenplay and Jacob Tremblay's performance have also received awards' attention. The film received four nominations for the 88th Academy Awards. Room was named one of the best films of 2015 by over 50 critics and publications. The film also won nine Canadian Screen Awards, including Best Motion Picture, Best Direction, Best Adapted Screenplay and Best Actress in a Leading Role for Larson. It won seven awards at the 13th Irish Film & Television Awards, including Best Film, Director for Abramson, script for Donoghue and International Actress for Larson. ^ "ROOM". British Board of Film Classification. November 5, 2015. Archived from the original on December 24, 2015. Retrieved November 5, 2015. ^ "Canada, Ireland lay claim to Oscar nominees Room and Brooklyn". CBC News. February 27, 2016. Archived from the original on March 3, 2016. Retrieved July 7, 2016. ^ Coyne, Kevin. "Room". Irish Film Institute. Archived from the original on August 17, 2016. Retrieved July 23, 2016. ^ The Canadian Press (September 21, 2015). "TIFF 2015: Room wins People's Choice Award as festival wraps". CBC News. Archived from the original on May 9, 2016. Retrieved July 22, 2016. ^ "Room BFI website". British Film Institute. Archived from the original on October 1, 2017. Retrieved October 1, 2017. ^ a b "With indie films such as 'Brooklyn' and 'Room', the creativity often begins with the financing". Los Angeles Times. December 29, 2015. Archived from the original on July 12, 2016. Retrieved February 23, 2016. ^ "Room (2016)". The Numbers. Archived from the original on April 5, 2016. Retrieved March 28, 2016. ^ Nathoo, Zulekha (February 26, 2016). "Oscar-nominated Emma Donoghue wrote Room screenplay before book came out". CBC News. Archived from the original on June 12, 2016. Retrieved July 22, 2016. ^ a b Medley, Mark (October 22, 2015). "On set of the Room as Donoghue watches her novel come to filmic life". The Globe and Mail. Archived from the original on December 19, 2016. Retrieved July 26, 2016. ^ a b Fear, David (November 12, 2015). "'Room': How a Dark Indie Became 2015's Left-Field Oscar Contender". Rolling Stone. Archived from the original on August 31, 2017. Retrieved July 22, 2016. ^ a b The Early Edition (September 28, 2015). "Emma Donoghue, author of bestseller Room, talks about turning her book into a film". CBC News. Archived from the original on August 14, 2016. Retrieved July 22, 2016. ^ Wise, Damon (October 15, 2015). "'Room' Director Abrahamson Makes Unlikely Stories Accessible". Variety. Archived from the original on June 24, 2017. Retrieved July 23, 2016. ^ Barlow, Helen (September 30, 2015). "Emma Donoghue on the Room with a different view". Irish Examiner. Retrieved July 23, 2016. ^ Vlessing, Etan (September 12, 2015). "TIFF: Why Canadian Co-Productions Thrive in Ontario". The Hollywood Reporter. Archived from the original on February 2, 2017. Retrieved January 23, 2017. ^ Slotek, Jim (March 19, 2016). "Room's Jacob Tremblay shows young stars have come a long way". Toronto Sun. Archived from the original on September 16, 2016. Retrieved July 24, 2016. ^ Sandell, Laurie (January 20, 2016). "Brie Larson's 20-Year Climb to Overnight Stardom: I'm 'Totally Out of My Comfort Zone'". The Hollywood Reporter. Archived from the original on August 2, 2016. Retrieved July 23, 2016. ^ a b Bramesco, Charles. "Brie Larson on why Room is more "lovely" than "harrowing"". The A.V. Club. Archived from the original on October 16, 2015. Retrieved October 14, 2015. ^ a b c d Ahearn, Victoria (October 21, 2015). "Brie Larson on 'Room' role, bonding with clever young co-star Jacob Tremblay". CKWX. The Canadian Press. Archived from the original on March 18, 2017. Retrieved March 17, 2017. ^ Sumanac-Johnson, Deana (October 23, 2015). "Room, starring Brie Larson and Jacob Tremblay, earns Oscar buzz despite dark subject matter". CBC News. Archived from the original on March 20, 2016. Retrieved July 22, 2016. ^ Riley, Jenelle. "'Room's' Brie Larson, Joan Allen Praise Breakout Star Jacob Tremblay (Video)". Variety. Archived from the original on February 5, 2018. Retrieved July 22, 2016. ^ McGahan, Michelle (February 25, 2016). "Did Jacob Tremblay Wear A Wig In 'Room'? That Long Hair Was Very Convincing". Bustle. Archived from the original on July 8, 2016. Retrieved July 22, 2016. ^ Freshwater, Lori (December 20, 2015). "Joan Allen on 'Room'". Los Angeles Review of Books. Archived from the original on August 12, 2016. Retrieved July 23, 2016. ^ Scott, Walter (February 26, 2016). "Did Joan Allen Do Research for her Role in Room?". Parade. Archived from the original on August 17, 2016. Retrieved July 29, 2016. ^ "Four actors leave big impressions with small roles". Los Angeles Times. December 22, 2015. Archived from the original on August 9, 2016. Retrieved July 29, 2016. ^ a b c Tapley, Kristopher (November 19, 2015). "'Room': Creating a Whole World in a 10-Foot Space". Variety. Archived from the original on February 5, 2018. Retrieved July 27, 2016. ^ a b Buxton, Ryan (December 18, 2015). "Why 'Room' Director Lenny Abrahamson Spent A Month Hiding In A Bathtub". The Huffington Post. Archived from the original on August 2, 2016. Retrieved July 22, 2016. ^ a b Brunhuber, Kim (February 25, 2016). "Oscar-nominated Room required painstaking precision from cast and crew". CBC News. Archived from the original on June 12, 2016. Retrieved July 22, 2016. ^ Bramesco, Charles (October 14, 2015). "Brie Larson on why Room is more 'lovely' than 'harrowing'". The A.V. Club. Archived from the original on October 16, 2015. Retrieved July 27, 2016. ^ a b Lytal, Cristy (December 3, 2015). "The cinematographer of 'The Danish Girl' and 'Room' details shooting such 'extreme opposites'". Los Angeles Times. Archived from the original on August 17, 2016. Retrieved July 27, 2016. ^ McNary, Dave (November 10, 2014). "AFM: William H. Macy, Joan Allen Join Brie Larson's 'Room'". Variety. Archived from the original on February 6, 2018. Retrieved November 17, 2014. ^ "On The Set for 12/15/14: JJ Abrams Wraps 'The Cellar', Tom Hiddleston Finishes 'I Saw the Light' & More". ssninsider.com. December 15, 2014. Archived from the original on September 24, 2015. Retrieved December 16, 2014. ^ a b Murphy, Mekado (December 23, 2015). "Below the Line: Editing 'Room'". The New York Times. Archived from the original on January 3, 2018. Retrieved May 6, 2017. ^ Grobar, Matt (December 7, 2015). "Editor Nathan Nugent On 'Room': 'We Tried Not To Get In The Way Of The Great Performances'". Deadline Hollywood. Archived from the original on June 21, 2018. Retrieved May 6, 2017. ^ Ford, Rebecca (May 18, 2014). "Cannes: Brie Larson Drama 'Room' Goes to A24 Films". The Hollywood Reporter. Archived from the original on January 16, 2015. Retrieved November 17, 2014. ^ "Lenny Abrahamson's Room to have world premiere at the Telluride Film Festival". Elementpictures.ie. September 4, 2015. Archived from the original on March 4, 2016. Retrieved February 28, 2016. ^ "Toronto to open with 'Demolition'; world premieres for 'Trumbo', 'The Program'". Screen Daily. July 28, 2015. Archived from the original on July 29, 2015. Retrieved July 28, 2015. ^ "Room". BFI London Film Festival. Archived from the original on March 11, 2016. Retrieved February 13, 2016. ^ McNary, Dave (July 29, 2015). "Brie Larson's 'Room' Set for Oct 16 Release". Variety. Archived from the original on February 5, 2018. Retrieved September 16, 2015. ^ Denham, Jess (January 7, 2016). "Room: Poignant exclusive clip sees Brie Larson make a birthday cake for the most adorable five-year-old". The Independent. Archived from the original on September 30, 2017. Retrieved March 18, 2017. ^ Kermode, Mark (January 17, 2016). "Room review – to see the world within four walls". The Guardian. Archived from the original on June 20, 2016. Retrieved March 18, 2017. ^ Jaafar, Ali; Fleming, Mike Jr. (January 14, 2016). "Oscar Nominations: Friendship Is Crucial Element For 'Room's Lenny Abrahamson And Ed Guiney". Deadline Hollywood. Archived from the original on March 18, 2017. Retrieved March 18, 2017. ^ D'Alessandro, Anthony (January 18, 2016). "'Ride Along 2' Continues No. 1 Journey With $41.5M; '13 Hours' Clocks $19.65M – Monday Update". Deadline Hollywood. Archived from the original on January 17, 2016. Retrieved February 28, 2016. ^ Schager, Nick (March 1, 2016). "Here Are the Must-Stream Movies of March 2016". Esquire. Archived from the original on March 19, 2017. Retrieved March 18, 2017. ^ Roy, David (May 20, 2016). "DVD of the week: Room". The Irish News. Archived from the original on August 16, 2016. Retrieved July 24, 2016. ^ Lincoln, Kevin (January 14, 2016). "Room Was Nominated for Best Picture Despite Making Historically Little Money". Vulture.com. Archived from the original on August 19, 2016. Retrieved July 22, 2016. ^ a b Houpt, Simon (January 21, 2016). "The marketing quest to turn Room into a populist hit". The Globe and Mail. Archived from the original on May 15, 2017. Retrieved July 26, 2016. ^ "Room triumphs at the box office". Irish Examiner. January 18, 2016. Retrieved July 22, 2016. ^ "Congratulations to the Irish Films BROOKLYN & ROOM on Winning BAFTA AWARDS". Irish Film Board. Archived from the original on March 14, 2016. Retrieved July 23, 2016. ^ "Room (2016)". Box Office Mojo. Archived from the original on July 24, 2016. Retrieved July 23, 2016. ^ "Room (2015)". Rotten Tomatoes. Flixster. Archived from the original on April 23, 2016. Retrieved April 21, 2016. ^ "Room Reviews". Metacritic. CBS Interactive. Archived from the original on September 12, 2015. Retrieved December 9, 2015. ^ McCarthy, Todd (September 4, 2015). "'Room': Telluride Review". The Hollywood Reporter. Archived from the original on December 12, 2015. Retrieved December 1, 2015. ^ Kohn, Eric (September 4, 2015). "Telluride Review: Brie Larson is a Revelation Alongside Stunning Newcomer Jacob Tremblay in 'Room'". Indiewire. Archived from the original on December 25, 2015. Retrieved December 1, 2015. ^ "Room". Room the Movie (official website). Archived from the original on January 4, 2016. Retrieved January 6, 2016. ^ Morgenstern, Joe. "'Room': Downsized Space, Vibrant Life". The Wall Street Journal. Archived from the original on March 18, 2017. Retrieved February 4, 2016. ^ Travers, Peter. "Room". Rolling Stone. Archived from the original on September 1, 2017. Retrieved February 4, 2016. ^ Hertz, Barry (October 23, 2015). "Room: Uplifting tale of miracles and love bound by a horrific kidnapping". The Globe and Mail. Archived from the original on November 26, 2017. Retrieved July 24, 2016. ^ Knight, Chris (October 22, 2015). "Room review: How a single room acts as an allegory for the chamber of our own minds". National Post. Archived from the original on March 20, 2016. Retrieved July 24, 2016. ^ Braun, Liz (October 22, 2015). "'Room' review: Film finds uplifting message in chilling tale of captivity". Toronto Sun. Archived from the original on September 16, 2016. Retrieved July 24, 2016. ^ Barnard, Linda (October 22, 2015). "Drama Room chilling yet uplifting: review". Toronto Star. Archived from the original on August 16, 2016. Retrieved July 27, 2016. ^ Clarke, Donald (January 14, 2016). "Room review: home is where the room is". The Irish Times. Archived from the original on February 13, 2016. Retrieved July 24, 2016. ^ Anderson, Daniel (January 13, 2016). "Room review". Irish Examiner. Retrieved July 24, 2016. ^ "In 'Room', Brie Larson tries to win a no-makeup Oscar". The New York Post. Archived from the original on December 1, 2017. Retrieved January 13, 2016. ^ Lickona, Matthew. "Room". San Diego Reader. Archived from the original on August 13, 2016. Retrieved July 24, 2016. ^ "National Board of Review Announces 2015 Award Winners". National Board of Review. December 1, 2015. Archived from the original on April 18, 2016. Retrieved July 17, 2016. ^ Gire, Dann (December 17, 2015). "'Mad Max: Fury Road' wins best picture from Chicago Film Critics". Daily Herald. Archived from the original on December 18, 2015. Retrieved December 18, 2015. ^ "Oscars 2016: Winners list in full". BBC News. February 28, 2016. Archived from the original on February 25, 2016. Retrieved February 28, 2016. ^ Rosen, Christopher (January 17, 2016). "Critics' Choice Awards 2016 winners: Spotlight, Mad Max, Leonardo DiCaprio, and more". Entertainment Weekly. Archived from the original on January 18, 2016. Retrieved February 17, 2016. ^ "The 22nd Annual Screen Actors Guild Awards". Screen Actors Guild Awards. Archived from the original on October 24, 2016. Retrieved February 9, 2016. ^ "Bafta Film Awards 2016: Winners". BBC News. February 14, 2016. Archived from the original on February 14, 2016. Retrieved May 20, 2016. ^ "Golden Globes 2016: Complete list of nominees". Los Angeles Times. Archived from the original on December 2, 2016. Retrieved December 10, 2015. ^ Belanger, Joe (December 10, 2015). "Emma Donoghue nominated for Golden Globe for her screenplay Room". The London Free Press. Archived from the original on August 21, 2016. Retrieved July 27, 2016. ^ "Best of 2015: Film Critic Top Ten Lists". Metacritic. Archived from the original on December 10, 2015. Retrieved February 12, 2016. ^ Pollock, Mitch (March 14, 2016). "q news: Room wins big at the Canadian Screen Awards". CBC News. Archived from the original on February 2, 2017. Retrieved January 25, 2017. ^ Cummins, Julianna (March 13, 2016). "Room cleans up at final night of 2016 Screenies". Playback. Archived from the original on January 3, 2018. Retrieved January 24, 2017. ^ Barraclough, Leo (April 11, 2016). "Brie Larson's 'Room' Sweeps Irish Film and Television Awards". Variety. Archived from the original on December 8, 2017. Retrieved July 24, 2016.